Cleaning with bargain products can take time, leave streaks, or scrape away at the protective barrier on your surfaces. Get a streak-free shine and maintain your invisible barrier coating in just two simple steps -- spray and wipe. Your cleaning time will be cut in half, but your surfaces will shine twice as bright. 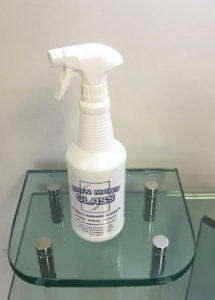 Our Glass & Surface Cleaner is designed to make your life easier, and refills are available for purchase right from our shop in Havertown. 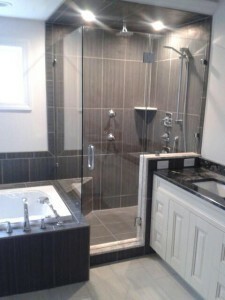 Even if your tub or shower seems beyond repair, you'll be amazed by what one cleaning from our team can do. Once the Surface Protector has been applied by the Bryn Mawr Glass team, maintaining sparkling clean surfaces couldn't be much simpler. Take home our Glass & Surface Cleaner for weekly use. Simply spray the solution and wipe with a microfiber cloth. No scrubbing or scraping necessary. Your kitchen, bathroom, and windows will be sanitary, free of build-up and protected from dirt and grime. You'll extend the life of these fixtures without the need for abrasives. Take the guesswork out of cleaning and trust the products used by the Delaware Valley's most trusted professionals. The Bryn Mawr Glass Surface Protector and Glass & Surface Cleaner make maintenance as easy as can be. 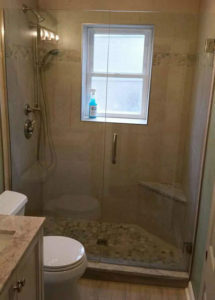 For more information or to purchase the Bryn Mawr Glass Surface Protector or Glass & Surface Cleaner, give us a call at (610) 853-2990 today! You can also contact us through our online form.